Hey guys! It is Science and Social Studies Saturday and I am squeaking in at the last minute with a post! Fingers crossed I can get this done before midnight! LOL! I wanted to share a few ideas on how to integrate Social Studies and Reading. In second and third grade there are a TON of historical figures to study. They are perfect for a biography study! Biographies are a great introduction to informational writing because they tend be sequential and follow the life of the person studied, with a clear beginning, middle, and end. It has a somewhat similar story structure to narrative. This makes it more familiar to most students. However, the big elephant in the room? Grade appropriate text. Yah. 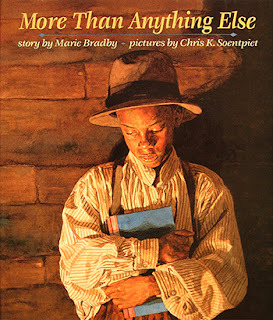 Finding stuff on Mary McLeod Bethune for a third grader to read independently is not so easy! LOL! I LOVE, LOVE, LOVE using science and social studies books for reading mini lessons. They still cover the content, and can also touch on those important people. I will say, I usually do NOT read a biographical book about the individual in reading until we have explored the person a few days in social studies. That way, students have a bit of background before plunging into informational text. However, there are lots of great LITERARY texts about time periods or experiences that can be great to build background, too. 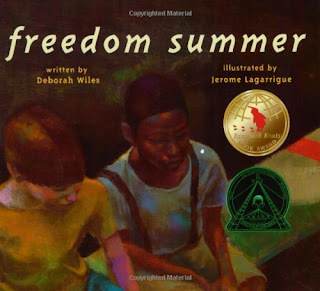 I love reading Freedom Summer before learning about MLK and Jackie Robinson. You can read the lesson I did with that book here. I haven't read this book (yet), but it looks like a great way to introduce the struggle of not being able to do something or follow your dream, because of something outside of your control (race, gender)- and then breaking through barriers! In the beginning of the year I use the book, More than Anything Else to teach a Hopes and Dreams lesson. I love, love, love, it. However, the book could also be read later in the year as a preview for not being able to do something (learn to read) due to race. You can get that lesson, free on my blog here. I have found it really difficult to find text on many of the figures for my students- especially when I taught third grade. Here is a list that I put together from my Informational Writing Unit. They are for research, but you could also use them for read alouds. Click here or on the pictures to get your free copy! Here is the full unit. You can check out the unit in my TPT store here! I think my biggest struggle is to find grade appropriate texts the kids can read independently. Some of the books on the list above may fit. Unfortunately, whenever you are dealing with informational text, often the readability is just stinkin' so high! Even the little readers provided by my district were WAAAAYYY too high for many of my students. I decided to write some leveled, guided reading texts about the figures so there could be more accessible texts for students. So far I have written two packs: one on Jackie Robinson (2nd) and one on Susan B. Anthony (3rd). Each pack contains three, leveled readers (about a beginning, middle, and end of the grade level) as well as other activities. I am hoping to write more of these because I know that teachers need them! I also have a little, EXCLUSIVE freebie for you from the Susan B. Anthony pack! Just a few writing activities that can be done with my pack OR without it :). Hopefully it helps! Just click on the picture to get your freebie!!! Hopefully , this post gave you a few ideas on integrating!